Telescopic spring covers (Centry Covers) made of 1095 polished blue carbon steel provide long life and maximum protection of your rods, shafts, and screws from chips and other destructive elements. An equally important use is as a safety barrier to seal off pinch points and other hazards to prevent operator injury. These helical metal covers surround and protect critical cylindrical mechanisms: their overlapping coils seal out the contaminants while wiping away dirt and debris with each thrust. The spring action holds the unit in place as it expands and compresses between two parallel surfaces. 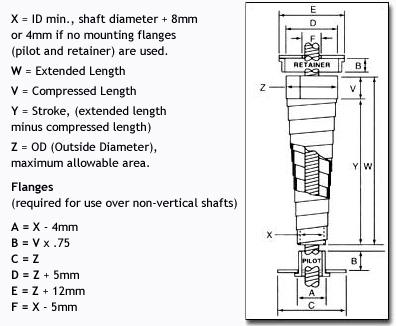 Simple flanges may be used to position the cover, which is normally installed over the end of a rod, shaft or screw assembly. However, “open wound” models are available to be wound onto the rod, shaft or screw without the necessity of partially disassembling the host machine. (See link to installation guide below) Covers are also available in stainless steel to address applications subject to rusting or pitting. 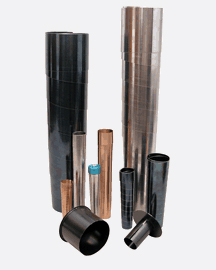 Sizes range from Internal Diameters of 7 to 300mm with extended lengths of up to 4500mm.Over 2,000 custom sizes are available with delivery normally between 1 and 2 weeks. A large catalog of Centry Covers are available from stock and may ship within 48 hours.